Nigeria federal government said to be making progress on the establishment of modular refineries in oil-rich Delta state with the arrival of one set of package shipment already in the country. 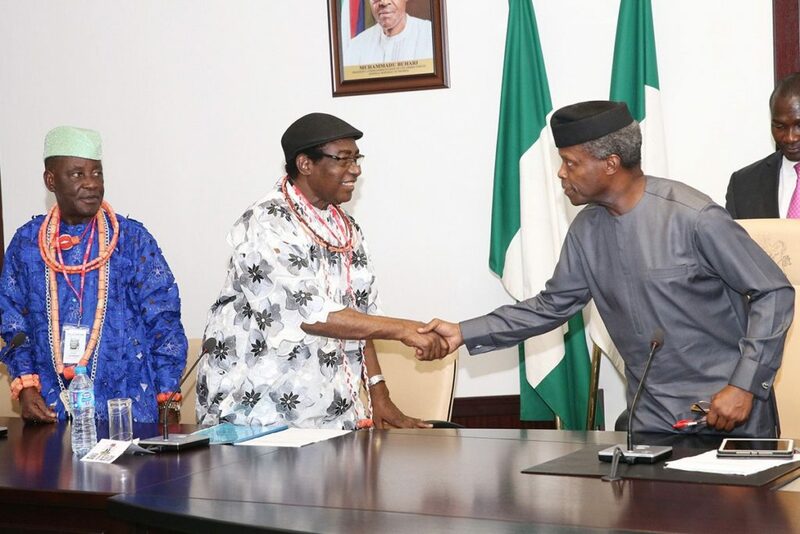 The Niger Delta Inter-Ministerial Committee, chaired by Yemi Osinbajo, country’s vice president has informed members at its meeting in Abuja that the refinery would be installed in Delta state. A statement by Laolu Akande‏, the senior special assistant on media and publicity to the vice president indicated that another set of refinery equipment would arrive the country in April and would be installed in Rivers. According to Osinbajo, communities, where the modular refineries would be installed are to benefit directly, especially in the creation of jobs and engaging their youths. It would be recalled that in December 2017, the Inter-Ministerial Committee received a report that 38 licensed privately-financed greenfield and mini-modular refineries’ investors had so far indicated interests in the establishment of refineries in the region. At that event, no fewer than 10 of the licensed investors were at an advanced stage of development. Also, the NDDC reported at the meeting its progress in the implementation of its projects in the region. It stated that in 2017, a total of 372 projects covering roads, bridges, electricity, water, amongst others, were completed by the commission. The development projects include the 25.7 km Nembe-Ogbia road, which would be inaugurated soon; the construction of Otueke Internal roads in Ogbia LGA, Bayelsa; Kira Dere Mogho road and Bridge in Gokana LGA, Rivers. The NDDC said it had established Job Placement centres expected to engage about 208,000 youths in the Niger Delta. To help reduce unemployment and youth restiveness in the region, the NDDC centres would match existing vacancies with available skills within the region. On the progress of Ogoni clean-up, the Hydrocarbon Pollution Remediation Project (HYPREP) under the Ministry of Environment, is set to commence the procurement process for contracting experts for the remediation and clean-up of impacted sites. The final draft of the Strategic Implementation Work Plan (SIWP), which provides a framework for the development of the Niger Delta, was also submitted to the committee. Meamwhile, the Nigerian Maritime University, Okerenkoko, Delta, is set to admit students into the institution for the 2017/2018 academic year, and start lectures in April. A total of 196 students have so far been accepted into the University while 76 applications were pending. President Muhammadu Buhari had approved an increase in the take-off grant allocated to the University from the N2 billion earlier announced to N5 billion This sum was included in the 2018 budget presented to the National Assembly in November 2017. In attendance at the meeting were the Minister of Niger Delta Affairs, Usani Uguru Usani; Minister of State for Environment, Ibrahim Jubril; and the Managing Director/Chief Executive Officer, Niger Delta Development Commission (NDDC), Nsima Ekere. Also in attendance were the Director-General, Nigeria Maritime Agency (NIMASA), Dr Dakuku Peterside; and the Special Adviser to the President on the Presidential Amnesty Programme, Brig.-Gen. Paul Boroh (rtd). Others include the Executive Secretary of NUC, Prof. Adamu A. Rasheed; the Vice-Chancellor of the Maritime University, Prof. Mrs. Ongoebi Etebu; and representatives of other relevant MDAs.